Sainte Mere Eglise is a small village located on the Cotentin Peninsula of France. Saint Mere Eglise was the first village in France to be liberated on D-Day. It was liberated by elements of the 82nd Airborne who parachuted in behind German lines early D-Day morning to support the amphibious landing of the 4th Infantry Division at nearby Utah Beach. In the center of the village square of Sainte Mere Eglise is the Normand church made famous by Private John Steele of the 82nd Airborne. Private Steele landed on the roof of the church and his parachute covered the church steeple. Steele hung from his parachute near the belfry of the church. He was deaf for weeks after D-Day because of the ringing of the church bell that was calling people to help extinguish a house fire in the village square of Sainte Mere Eglise. 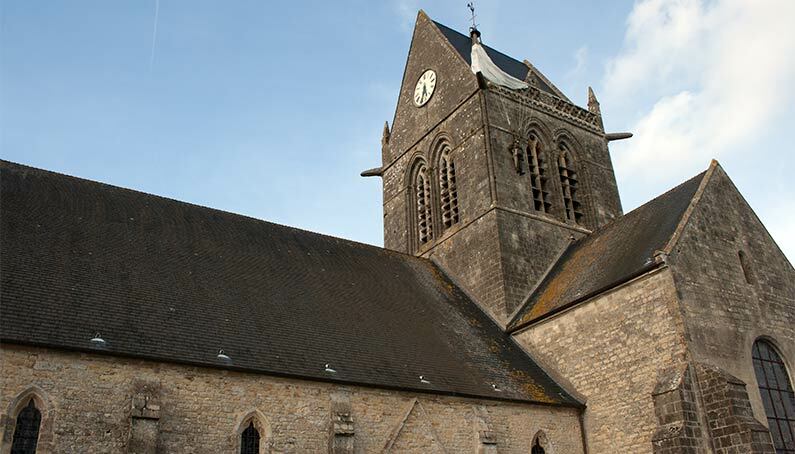 Sainte Mere Eglise was also involved in the first significant German counter attack on D-Day. It involved the German 6th Parachute Regiment against elements of the U.S. 82nd Airborne. By the end of day on D-Day, Sainte Mere Eglise was secured by American forces.Today, visitors to Sainte Mere Eglise will find a monument that honors the 82nd and 101st Airborne Divisions that landed in the area on D-Day. On the church in the village square hangs an effigy of John Steele with a parachute. The church that dates from the 11th Century also has stained glass windows that honor the memory of the U.S. paratroopers that lost their lives on D-Day. The Airborne Museum of Sainte Mere Eglise is also worth visiting.